Welbeck: heading for West Ham? West Ham are understood to be considering a move for England and Arsenal striker Danny Welbeck on a free transfer at the end of the season. 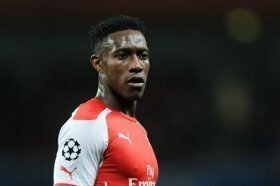 Welbeck, whose career with the Gunners has been dogged with injury, is ready to leave the Emirates in search of a new challenge. Danny Welbeck's contract will expire on June 1st and it is understood that Arsenal manager Unai Emery has yet to decide whether or not to offer the talented striker a fresh deal in North London. With West Ham also facing a summer striker contract crisis themselves, with forward Andy Carroll looking unlikely to stay with the Hammers, the Irons are rumoured to have made an approach for Welbeck already and are confident that a deal can be agreed. It is understood that Welbeck is also being monitored by teams abroad, with Spanish club Real Betis and French side Lille amongst the clubs poised to make a contract offer to the striker. Welbeck is not expected to play any further part in Arsenal's season.